In a blender, combine all ingredients until smooth. Taste and adjust seasoning to preference. Pour sunshine Mary mix into a food storage container or pitcher, cover and chill. 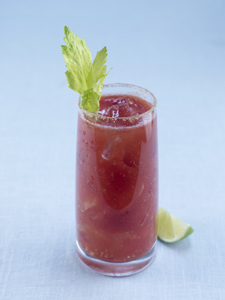 To assemble, combine 1 ounce of good quality vodka to every 6 ounces of sunshine Mary mix. Pour over ice and garnish with celery sticks.